I hope you all had a wonderful Easter weekend with your families! My weekend wasn’t crazy busy since I didn’t drive home to Austin, but I did enjoy a really lovely brunch with one of my best friends and her family yesterday. It’s really nice to know that even when I can’t make it home for holidays like this all the time, I am blessed with friends that include me and are always there for me. I love you all so much! Now onto the next topic. As you know, most of my blog content is fashion focused… but lately I’ve been thinking of sprinkling in more personal content. It wouldn’t all be on one particular topic, but more diverse and really whatever I feel like posting about at any given time. Don’t worry, you’ll still get your outfits, EDITS, and Under $100 roundups! I’m just thinking of adding a couple of posts each month that give you more insight into my actual life, help you get to know me a little better, and give you more insight into my personality and what I get up to when I’m not blogging. As always, if you ever have feedback, please comment in the text section below each blog post or send me an email! I love hearing from you and hope you enjoy this new content as much as stuff you first came to my blog for! Thank you all for continuing to follow along! 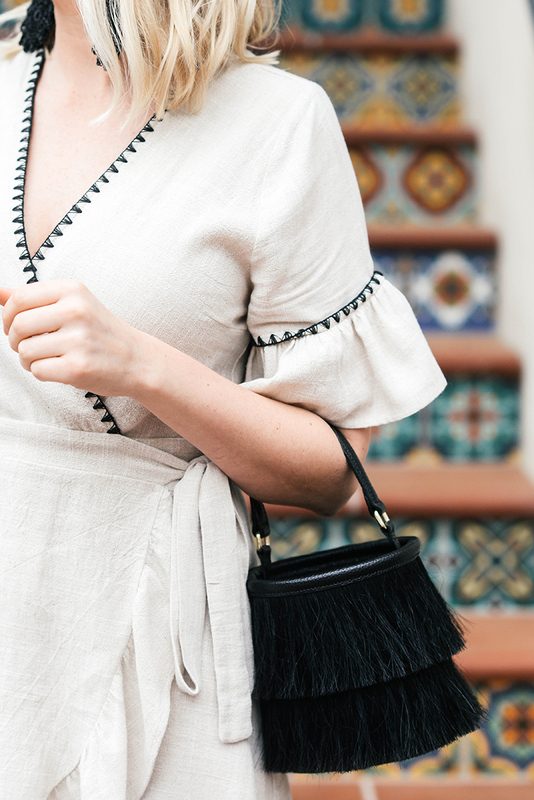 PS: if you’re looking for an easy day-to-night dress for spring/summer, don’t miss this linen wrap dress I found for under $80! It’s surprisingly not too short on my 5’9 frame and is easy to dress up or down. Definitely something I’ll be wearing all season long! Looking forward to more personal posts from you. Love this dress too! Super cute dress, looks great on you! I am definitely ordering it. Would also love more personal content, look forward to it! Such a gorgeous dress! Love that it’s so versatile! I have been wanting to add more personal content on my blog lately too and trying to figure out how to do that. I am all for it here! I love this dress and how you accented it. So chic as always, Merritt! Excited to see the new content you’ll create! I love that you will add more personal content! Can’t wait to read! And that linen dress is so cute! This outfit is SO perfect on you! !